This year's recitals will be held at Denton, Cottier and Daniels (689-6996), which is located at 460 Dodge Road, Getzville, NY 14068	and at Vinecroft Retirement Community. The Vinecroft Retirement Community (741-7741) is located at 5945 Vinecroft Drive in Clarence Center. Vinecroft Dr. is off of Newhouse which is between Roll Road and Clarence Center Road. Enter the main doors and the performance class will take place in the main dining room which is the found right off the main lobby. 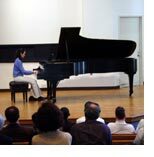 Below is a link to the application for the ASM's student recitals which are held on Saturdays at Denton, Cottier and Daniels, located at 460 Dodge Road, Getzville, NY 14068. There will be two, one hour recitals, one at 3:00, and the other at 4:00 p.m. There is a $5.00 charge for each performer and no admission charge for anyone who would like to attend the recitals. Please return this form to Steven Bianchi as soon as possible.